The finest Norfolk Coast holiday cottages from established local property letting agency. The small north Norfolk village of Great Snoring is a charming rural village only 7 miles inland from the coastal town of Wells-next-the-Sea. The market town of Fakenham is only 4 miles away and the picturesque town of Holt is 12 miles north east of the village. At the centre of Great Snoring stands the 13th century church of St Mary. Lancaster Barn is a magnificent barn conversion "Winners of The International Design & Architecture Awards 2018" with an absolutely stunning full height open plan living area, set in extensive grounds with the use of a hot tub. 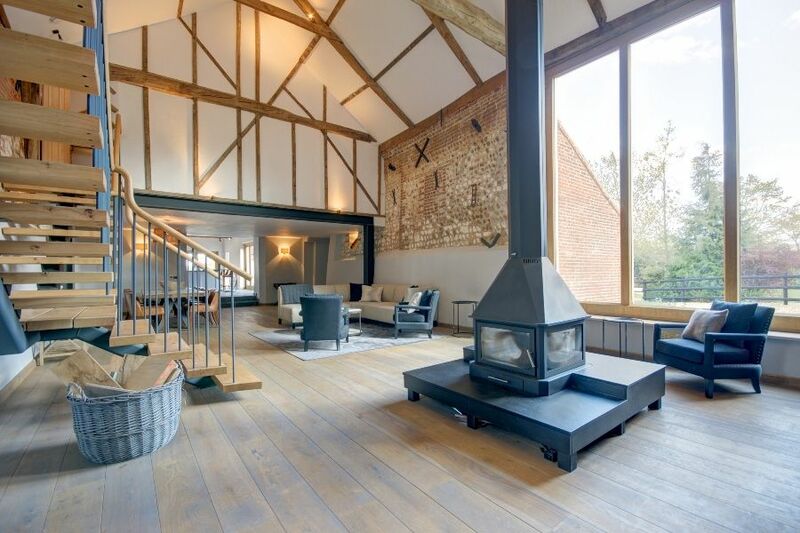 This substantial barn has been creatively converted to the highest possible standards to create a fabulous holiday home combining a wealth of original features, including beautifully preserved beams and exposed brickwork, with all the latest technology. In our opinion this barn is is truly one of the best places available for holiday lets in North Norfolk, being quietly located in an idyllic rural location within easy reach of the gorgeous coast, and being stylishly furnished by its professional interior designer owners, making it the perfect choice for families and friends to treat themselves for a special break. The luxuriously appointed and well-spaced out bedrooms ensure that no one has "the short straw" with three sumptuous bedroom suites ideal for couples, plus a downstairs wing with a lovely twin room and a bespoke bunk room, adjacent to a super games room. There is no shortage of outside space here as the barn is set in grounds of three acres, including fields, a trampoline, a football pitch, a sheltered courtyard garden, a bell tent in the paddock for guest use and the use of a natural wooden hot tub included in the rental price. The quintessential coastal town of Wells-next-the-Sea and the renowned beauty of Holkham beach may be easily reached within a 15 minute drive. Please note that any short break (if accepted by the owner) is charged at the minimum of £2500 (unless guest numbers are 4 or less). Copyright © 2019 Sowerbys Holiday Cottages Limited. Registered in England & Wales no: 7469925. Registered Office: Market Place, Burnham Market, King’s Lynn, Norfolk. PE31 8HD. All rights reserved.